John Ramsland University of Newcastle This entry posted March 11, 2015 . The problem of how to educate young people in sparsely settled and remote locations has been with the Australian colonies, territories and states for more than two centuries. Successive solutions included subsidised, provisional, part-time and travelling schools, as well as the delivery of curricula by means that have responded to changing information technologies. 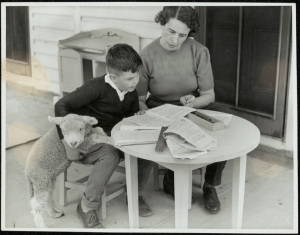 Early in the twentieth century Australian government departments of education in each state developed correspondence schools that originally relied on the postal service to educate outback and other children unable to attend school. The New South Wales Correspondence School in the former Blackfriars School in Sydney developed two powerful images. 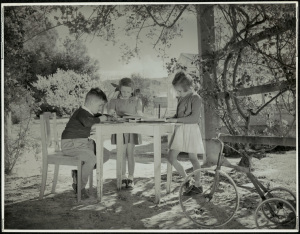 Black recognised the quality education provided to isolated children ‘in the lonely, silent places of the state’. Her visit demonstrates how authorities used the school as a showcase of the best in Australian education. She re-echoed the laudatory opinion that appears in other published accounts, including the Australian Council for Educational Research. Correspondence began as an experiment during the Great War with the closure of several Subsidised and Provisional Schools (see Glossary below). Early in 1916 chief Inspector SH Smith received a letter from a mother in the north-west complaining that her son’s education had been interrupted by the closure of Bingagee School. Responding, Smith undertook to teach the boy himself by post. Other pleas from the district followed. In October Smith found it necessary with six pupils to arrange a teacher, Will Carter, to undertake the burden. The Director-General Peter Board, after sighting a press clipping describing an experiment in correspondence teaching, directed his Department to follow suit. By 1917 in New South Wales twenty-seven isolated children from eleven families had enrolled in writing, composition, spelling and arithmetic in the School conducted by Carter. Handwritten lessons were sent. The experiment struggled on for the remainder of the war, but under the watchful eye of Smith as the numbers grew. By July 1918 it was decided to establish a second correspondence school under Walter Finigan, a recently-returned war veteran who was paralysed in one leg. Before joining the Australian Imperial Force, Finigan had been headmaster of Wilcannia Public School with a sound knowledge of the needs of the country child. He was a co-founder of the Gould League of Bird Lovers in 1910. Carter continued to operate the No 1 Correspondence School. They worked together in a small room in Head Office. (The first female appointed was Miss A. Adams.) 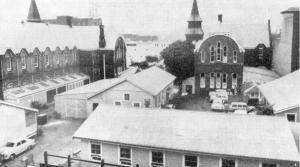 No 2 School was shifted to a classroom at the Plunkett Street Public School in 1921. No 1 School was transferred there, but continued to operate separately. Their work expanded as more Subsidised Schools were closed. At 1918’s end, 108 pupils were enrolled. A third school was opened. During the eight years following 1916, four separate correspondence schools were established, housed in existing schools. By late 1920, 586 pupils were enrolled. By the end of 1923, the number was 1,975. In early 1924 correspondence lessons were sent to 2,355 children living more than three miles from a school. Many children were more than 50 or 100 miles from the closest school. The whole was a significant educational enterprise, but lacked the inevitable central organising structure. On 1 July 1924, S. H. Smith, now as Director-General, amalgamated the correspondence schools at the empty Blackfriars Public School in Buckland Street, Chippendale, a factory district. The buildings had been erected in 1883 amidst the euphoria for public education that had followed the 1880 Public Instruction Act. It was described as ‘the largest and most palatial school buildings in New South Wales’. When the correspondence teachers moved in, in mid-1924, the buildings seemed draughty with few amenities. The surrounding cityscape was of crowded laneways and grimy workshops–a more urbanised environment could not be imagined for a school that ironically would cater for children ‘in the wide-open spaces’, isolated from noisy metropolitan streets. The two neo-gothic buildings were of brick and sandstone. It was here that the Correspondence School would be housed until its removal. The School admitted children from the age of seven and followed the primary course to the Qualifying Certificate (see Glossary). Finigan had a daunting task. The School’s enrolment was 2,294 by the end of 1924. The forty-three teachers were nearly all too handicapped to teach in classrooms. Many like Finigan were veterans of the Great War suffering from physical and mental disabilities. Some of the women were afflicted by growing deafness or were elderly and unwell. The School was already by far the largest in the State. Despite this, it was rated by the Department as a small fourth-class primary school. Finigan stated that, after some doubts, he gave ‘earnest consideration’ to a ‘plan of operation’. He formulated a system on three principles: individual tuition; the cooperation of parents and ‘what is best for the child’. Under his leadership, Blackfriars developed into the largest most respected correspondence school in Australia. Early in 1925 the printed leaflet was introduced to provide guidance and standardise the content taught. Each leaflet provided for a full five days of work along lines similar to the Helen Parkhurst’s Dalton Plan with individualised learning. The leaflet, as a self-contained unit, soon became a highly successful learning device. It was improved and redesigned, especially after 1938 under the direction of Harry Kellerman as Deputy Headmaster. 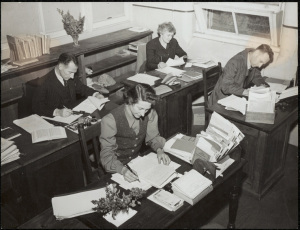 The correspondence pupils worked in three separate workbooks which circulated over the set five-day periods. At any one time, one was being marked by the teacher, a second was in the post and a third was in the pupil’s hands. A small amount of post-primary work in English, Geography, Arithmetic, Mensuration and Farm Book-keeping was initiated in 1923. In 1932 Finigan gained permission for students to sit the Intermediate Certificate Examination in English, History, Mathematics I and II, Geography and Art – and a few did. Nevertheless, post-primary pupils were a small proportion of enrolments throughout the 1930s. The School remained essentially a primary school. In 1936 primary instruction was given to 7,032 children and secondary instruction to 431. Of these only seven pupils sat the Intermediate Certificate Examination. Three were successful. On 7 June 1933 a half-hour school radio broadcast over National Station 2FC began with ‘Mr Finigan discusses plans for the term’. These talks continued weekly throughout each term. They came live from the Headmaster’s office over a landline to the Sydney studio and from there to transmitting stations. The majority of pupils during the Great Depression were outback children. Some were with travelling circuses, sideshows or theatrical companies under child welfare licences. Others were incapable of attending school on medical grounds. The Outpost wishes to help our pupils and ex-pupils to keep in mind the State’s need of citizens who are honourable, just, tolerant, and actuated by the spirit of brotherhood, both with our own fellow citizens and with the peoples of other nations … success in life is not perhaps so much a matter of talent or opportunity as of concentration and perseverance. To excel is the idea in the School motto – “Whatever you do, do well”. Do not forget that it takes labour, sometimes toilsome labour, to excel – Nihil sine labore (“Nothing is accomplished without labour”). The Teachers Federation in 1938 had another perspective while recognising the excellent work done by Blackfriars; work carried out by its own members. It believed the school could never ‘fully satisfy the needs of the country children’ no matter how widely it expanded. The Federation was concerned about the burden on parents that the supervision of correspondence imposed. As a professional association it expressed an underlying viewpoint that the process of education should be entirely in the hands of professionals without the direct involvement of parents. In August 1938 Finigan took examples of the pupils’ best work when he was a delegate at the International Conference on Correspondence Education in British Colombia, Canada. The occasion placed Blackfriars centre stage as the premier correspondence school. Earlier that year, the school received a ‘fine appreciation’ in The Scotsman and the Geneva Bulletin of the International Bureau of Education praised it in a long article. Both articles were based on The Outpost of 1937 sent by Finigan. As a result of awareness raised at the conference, a study in the United States recognised Blackfriars as the ‘Gibraltar’ of correspondence schools with a ‘functional and dynamic’ educational program. Finigan’s system was viewed as a model to follow by sparsely-populated states like Nebraska, Illinois and Montana. A Montana Department of Public Instruction bulletin described the ‘remarkable work done in Australia’. Such was Blackfriars international reputation in the late 1930s before World War II; it was not until 1948 that another international conference was held, but by that time Finigan was about to retire and did not attend. 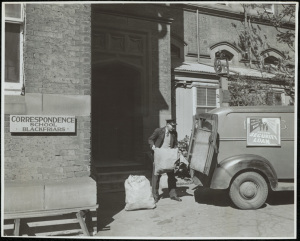 In 1946, Blackfriars featured internationally when the United Nations Educational Scientific Cultural Organisation decided to make a film on correspondence education in Australia. The documentary was produced by the National Film Board. 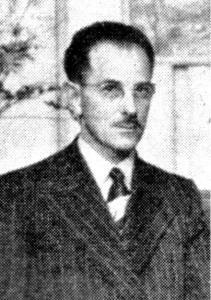 The director Stanley Hawes was a Canadian on secondment. “School in the Mail Box” was commissioned by the Commonwealth for showing at the UNESCO Conference in Paris in November 1946. It was filmed in two language versions: French and English. Sections in New South Wales showed a scene at Blackfriars with Finigan and Kellerman in the Headmaster’s office discussing the design of new leaflets. The teachers were seen systematically at work in the classrooms of the old building. One teacher was presenting a broadcast. 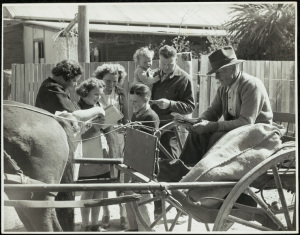 Other scenes were filmed in the Southern Tablelands on properties, including the mailman on horse and cart delivering mail to eager children; also children working at their school assignments on farms, from bush humpies to airy station verandahs. The narrative emphasised the circle of interdependence of teachers, parents, pupils, the Australian Broadcasting Commission, the Post Office and the railway. The film was twenty minutes long and had film units working in the Northern Territory, Victoria, Queensland and New South Wales. It received an enthusiastic reception at the Paris Conference. Director of the ACER, Kenneth Cunningham claimed as early as 1931 that news about the excellence of the Australian correspondence systems had spread to places like Soviet Russia, the United States, the Belgian Congo, Manitoba, Labrador, Patagonia and Romania. In 1950 Kellerman was appointed Headmaster when Finigan retired. The two men dominated the scene from 1924 to 1963 providing an unusual continuity of leadership. Both did much to create the system’s ethos. They were dedicated, religious in their orientation: Finigan a devout Methodist, Kellerman a member of the Jewish community. Both held high office in Freemasonry and were adherents of neo-Herbartian teaching methodology. Nevertheless, they had contrasting leadership styles. He was aloof, but could provide an ‘attentive ear’ when a staff member needed support. He turned a blind eye on ‘frailties’ where a war veteran was concerned. But he ‘didn’t stand any funny business’. An authoritarian, he set high standards in dress and behaviour. Yet the staff ‘loved him, absolutely worshipped him!’ Six hundred teachers worked under him during his reign. Kellerman became a foil to Finigan. More approachable, he constantly negotiated with the teachers. He was an energetic, insightful teacher who believed there were no bad students only bad teachers. Given responsibility to build the secondary division, Kellerman focused on identifying ways that the program could be articulated. With Finigan’s support, he devised marking methods and reviewed the leaflets to make sure they were pedagogically sound and fulfilled syllabus aims. Kellerman was concerned about the low classification of correspondence teachers; several had been haphazardly placed. He found that ninety-five percent of teachers appointed were handicapped, either physically or emotionally and were classed as incapable of performing normal face-to-face teaching. Apart from returned soldiers, all teachers were re-classified when they arrived at the 3rd level (the lowest teacher classification) and their salaries were reduced accordingly. Kellerman noted they were paid a salary that was half-way between the average salary of a teacher and that of a clerk. No teacher could ‘advance beyond 3rd class … as the efficiency mark couldn’t be gained only on literary marks being awarded’. Harry Kellerman in the Headmaster’s office, The Outpost. Kellerman felt that the low status of teachers had a negative effect on self-esteem. He gained a place on the NSW Teachers Federation executive to take up the cause. Through negotiation, he achieved a Public Service Inquiry in 1941 where he presented an eloquent case and succeeded in having the discriminatory classification altered. Within certain restrictions correspondence teachers could gain reclassification and prove their efficiency within the context of correspondence teaching. This introduced an incentive system, improving efficiency while enhancing teacher morale. Kellerman convinced Finigan that some teachers had been inappropriately placed in sections on arrival and these were moved to more appropriate ones. This also improved morale. When Kellerman became headmaster, his dynamic leadership brought changes. The school expanded into new areas and the pupil intake altered significantly. Students were able to sit for the Leaving Certificate Examination for the first time. More students enrolled at secondary level coming from diverse backgrounds. Some were children of overseas diplomats, patrol officers or colonial administrators in Papua-New Guinea or the armed forces in Malaysia or missionaries in South-East Asia. There were still children in rural settings or with travelling families. Some pupils who attended Subsidised Schools were automatically supplied with correspondence materials and the teacher acted as supervisor. Some were pupils at central schools studying senior secondary subjects through the Correspondence School; others were in high schools enrolled in subjects not offered locally. A number of young people in gaols continued their secondary education by correspondence. In 1950 Kellerman attended the International Conference of Correspondence Educators in New Zealand and later in Oregon. In 1961 he visited correspondence schools in North America, Scandinavia and the United Kingdom where he studied the use of visual aids, radio and television broadcasting and the teaching of science. Returning, he made a comprehensive report and put forward recommendations for implementation. In the early 1960s, the Education Department brought in time-and-motion experts to evaluate Blackfriars. They recommended changes including breaking the wholistic role of the teacher in his/her relationship with the individual child by moving teams of clerks into the program to carry out clerical work for incoming and outgoing mail – thus breaking an established ritual. Kellerman resisted until he retired. In December 1965, Blackfriars had over 6,000 pupils with 3,500 at secondary level and 380 teachers. As a result of the overcrowding in the old buildings, the secondary division was separated and moved to an office of steel, glass and pink tiles on the corner of William and Riley Streets. It had nothing of a school atmosphere. By 1967 the fade-out of Blackfriars was complete. In July the primary section was transferred to William Street. Its open-area design with glass partitions made surveillance of teachers by their supervisors simple. In 2015, the Blackfriars building stood padlocked and empty. Qualifying Certificate. Examinations for this credential were first held in 1910. They were externally set and marked, conducted by the NSW Education Department. The examination had multiple purposes that included the marking of the completion of primary school, the selection of students for high schools and other post-primary schools, and the allocation of bursaries. Subsidised and provisional schools. Subsidised schools (1903-1989) were designed for localities where enrolment numbers fell below that required for the smallest government school. Parents provided the school and the teacher, and were subsidised by government for each child attending. Provisional schools emerged in 1867; in 1957 the last was converted to a public school. Originally these schools were for for enrolments of between 15 and 25 students. Parents provided the buildings and school furniture, the Education Department provided teacher, books and equipment. The levels of enrolment and conditions of Department support varied over the years. Black, Catherine. 1939. King’s Nurse – Beggar’s Nurse, London: Hurst and Blackett. Crane, AR and WG Walker. 1957. Peter Board: His Contribution to the Development of Education in New South Wales, Melbourne: ACER. Cunningham, K. S. 1931. Primary Education by Correspondence, ACER, Melbourne: Melbourne University Press. Kellerman, M. H. 1990. Handwritten answers to author’s questionnaire. Taped interview with author. O’Neill, Josephine. 1946. ‘The Kids Make a Good Show’, Daily Telegraph, 19 October. Ramsland, John. 1991. ‘The “Gibraltar” of Correspondence Schools, Blackfriars, Sydney 1924-1965’, Journal of the Royal Australian Historical Society, 77 (2), 43-52. Rayner, S. A. (compiler). 1949. ‘Correspondence Education in Australian and New Zealand’, ACER Research Series, 64, Melbourne: Melbourne University Press, XII (6) April 1932, 213. 1980. Sydney and the Bush. A Pictorial History of Education in New South Wales, Sydney: NSW Department of Education, 182. 1907. The Cyclopedia of New South Wales: An Historical and Commercial Review, Sydney: McCarron Stewart and Co, 228 & 233.